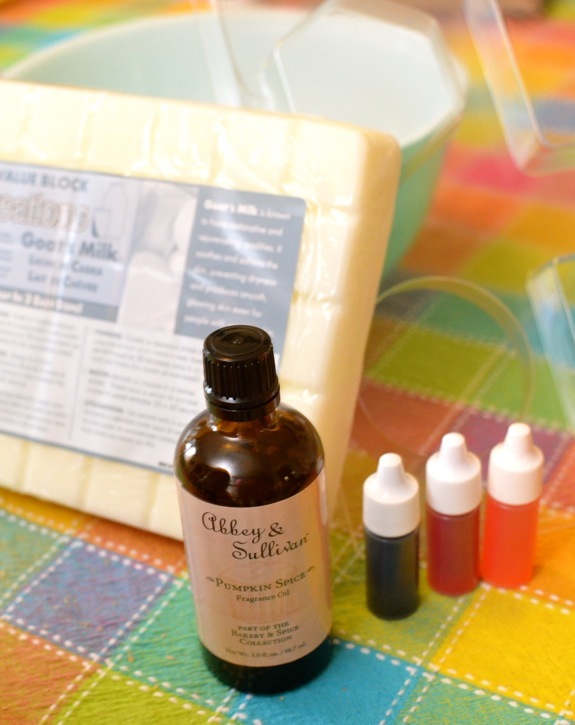 You are here: Home / Activities / Adventures in Soap Making! With the Thanksgiving holiday right around the corner, the kids and I wanted to make some special handmade hostess gifts for my mom, who will be hosting Thanksgiving dinner this year. ((Thanks, Mom!)) 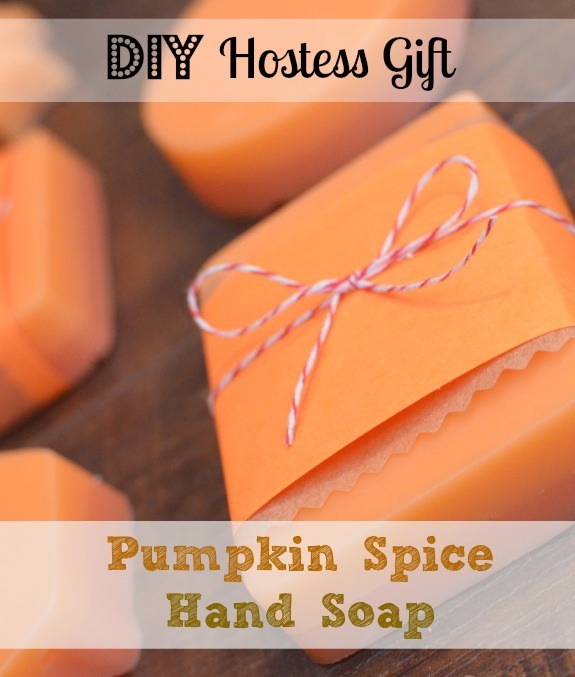 These pumpkin spice hand soaps fit the bill perfectly! They would be lovely gifts for teachers, neighbors, or friends too! First, you will need to gather your materials. 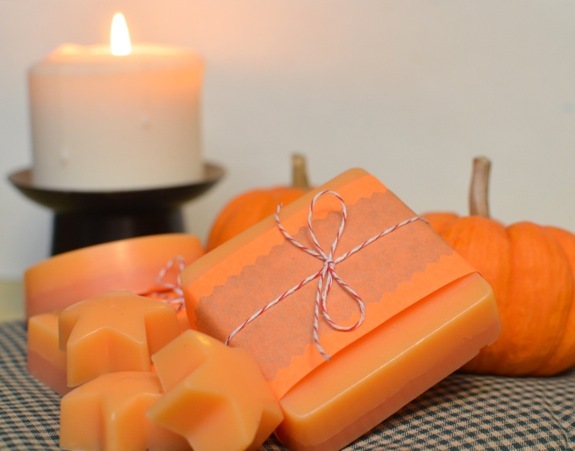 All of our soap making supplies were ordered from ConsumerCrafts.com — a 2 pound block of goat’s milk soap base, pumpkin spice fragrance oil, soap dyes (if desired), and soap molds. You will also need a spoon and a mixing bowl that is microwave-safe. I chopped up the goat’s milk soap into cubes, and microwaved them as-per the instructions on the package. Then added the fragrance oil and dye. I invited Emily over to stir it all up, and spoon the melted soap into the molds! She thought this was so much fun!! You can experiment with the dye colors, and Emily was particularly happy to layer the colors. Just be sure to allow the bottom layers enough time to harden up a bit before adding another layer. About 45 minutes later, our bars of hand soap were completely hardened and ready to be popped out of their molds. 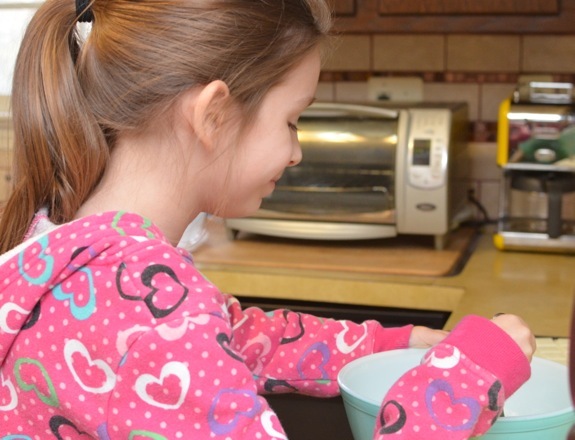 Emily was also helpful in wrapping up our sweet-smelling soap to give to her teacher, friends, neighbors, and of course, our very special hostess! She was so PROUD of how they turned out!! This was such a simple and fun project, and the end result is something just about any hostess can use to freshen up their bathroom! How much does a set of these cost (approx)? Around $15 for supplies — a 2lb bar of soap base makes about 8-10 full size bars, and you may be able to make some travel size bars too. Of course, the soap molds can be used over and over again. Your soaps came out so beautifully! You are convincing me to give it a try! This was our very first attempt! It’s easy and fun to do! These are so pretty -and something Emma would really enjoy making. Thanks for the inspiration! About how much spice and dye do you add and how many cut up bars? Want to try but am not good at this kind of thing and want to make sure I have the amounts right. Thanks. Can glycerin base be used instead of goats milk base? try popping them in the refrigerator — once they are nice and cool, they should pop out a lot easier. hope this helps!